Our line of aluminum rotorblades are, without question, the finest value in the sport rotary-wing industry. They have also been successfully used for wind generators. Some of our blades are manufactured as a single extrusionwithout seams, rivets or bondingof high-strength aluminum, providing exceptional performance and reliability plus the greatest strength for their weight of any blades on the market. And yet, they are priced far below the competition. We offer sizes for any homebuilt rotorcraft applicationboth for the main and tail rotor of helicopters (the NACA 0012 series), or for the main rotor of gyroplanes (the NACA 8H12 blades). These blades are retrofittable on such popular helicopters as the RotorWay Scorpion, Exec and Talon, the Safari, the Hot Rod Helicopter, Commuter, Adams-Wilson Choppy, Aeros, etc. ; and for the wide variety of one- and two-seat gyroplanes. 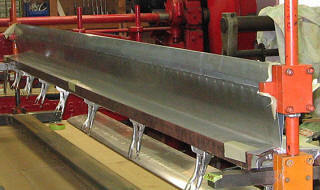 The extruded aluminum blades are easily cut to size where required. Further, their cellular construction makes mounting and balancing a simple matter. Customization in length and mounting is available. Blade prices and design subject to change without notice. 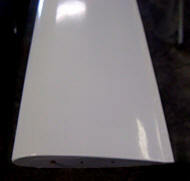 Need a custom airfoil? We supply airfoils for special projects such as windmills / wind generators and OEM rotorcraft. Send us details of what you need for a price quote. The cutaway view on the left illustrates the cellular structure of the single extrusion comprising the Vortech extruded-aluminum rotorblades. This construction yields an amazingly light, yet torsionally rigid rotor system. While this cutaway illustrates an asymmetrical (8-H-12) blade, VI also offers symmetrical (0012) blades. Key: "=inches; '=feet; 12 inches=1 foot; 1"=2.54cm; 1'=30.48cm (0.3048m). Also see our line of complete gyroplane rotorblades with hub, ready to mount! 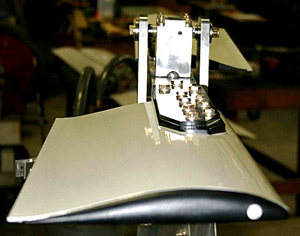 Our gyroplane rotorblades are clearly the finest and most affordable in the industry. They come with an ultra-smooth, highly aerodynamic powder coating that eliminates the need for painting while providing all-weather protection. Each set comes virtually ready-to-mount with an adjustable hub bar that fits all standard rotorhubs. See more online at our gyrokits website. 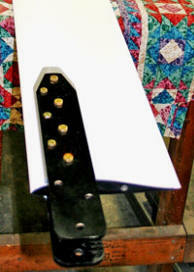 *The 4" x 6' blades do not include mounting plates, leading-edge spars or root & tip caps. **The composite-aluminum hybrid blades are available in virtually any size and include tip caps. Also available in carbon-fiber. Please inquire. 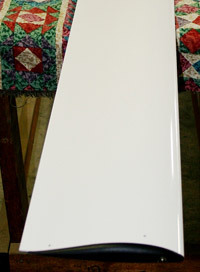 ***The 7" & 8" x 10' and 12' aluminum blades are 100% aircraft-grade materials, bonded and riveted. Each set includes tip caps, mounting blocks and root-end inserts; they are primed for painting. Custom lengths are available. ****The 4.75" and 5.25" blades only come with tip caps; no leading-edge spars or mounting plates. Blade prices and design subject to change without notice. SPECIAL OFFER: Discounts may be available for large orders. Please inquire. PO Box 511 � Fallston, MD 21047 � U.S.A.